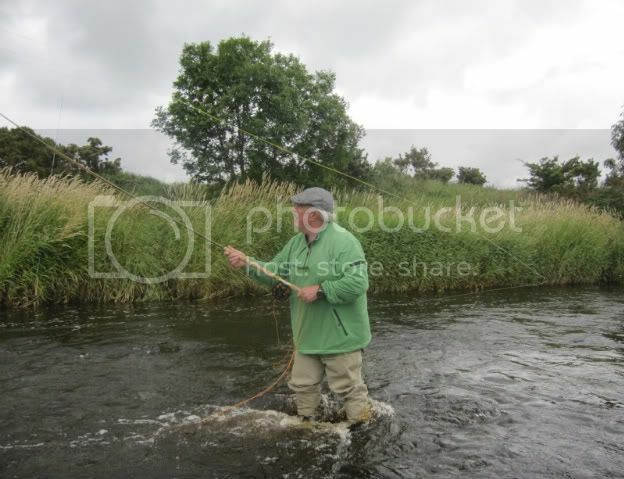 Easily one of Ireland's most experienced salmon fly anglers is Frank Elliott from the Foyle system. Frank is a person I admire greatly and for many reasons. Among those reasons are his exceptional Spey casting ability (see styles also), and his long salmon fishing experience making him a very astute angler. He passes this knowledge on to those that are clever enough to listen. Also an all round decent person of absolute integrity and a real character. Many a good story and a good laugh we have shared, and a few fly dressings also. This sea liced fresh fish was taken on 6th March 2009 on the Finn. A twelve pounder caught on a McCormick's Shrimp fly. What is significant is that this makes the 57th year out of 58 fishing years that Frank has taken Spring fish in March. Not a bad record. Apart from those years there were two years that the fishing did not open in March on the Finn, 1960 and 61 I believe but I could be wrong, must check that out with Frank. I have some very good friends in the Mourne Valley Including Frank Elliott, Gerry McAleer, Victor Wallace and some other local anglers around Paddy's Stream. The leg pulling and banter can be very good on the banks of the Mourne. Some people share similar interests at the same time and Victor Wallace was one of the people who was seriously into Underhand and shooting head casting before it was as popular as it is today. I was very interested in it too and was very fortunate to have learned directly from some of the Scandinavians at that time. I have spent some happy times discussing and experimenting with salmon fishing, salmon fly-casting and salmon fly-tying with Victor. Victor is an expert fly-caster and particularly proficient in Underhand casting with shooting heads. He lives within walking distance of the river and teaches salmon Fly-Casting. Victor is a good fly tyer and has been tying salmon flies for 45 years. He particularly likes the Shadow shrimps. Victor's fly tying orders and casting Instruction is, like that of others, perpetuated by recommendation from people who see him casting or use his flies. That is the way most custom fly-tying is in Ireland - what is called return custom. Victor Wallace with a nice V loop set up in casting practice, Victor is using a shooting head and a G.Loomis stinger rod 14'. Victor is one of the best shooting head casters.